The first week of Term 2 has just passed and through that week the whole of team 5 had a big art rotation in each class. Everyday after morning tea we would go to a different class to observe a new artist's style of art. Every artist had an individual style of ways to paint. After morning tea on Tuesday my class had to go to room 22 to where we would be looking at the style of Vincent Van Gogh. 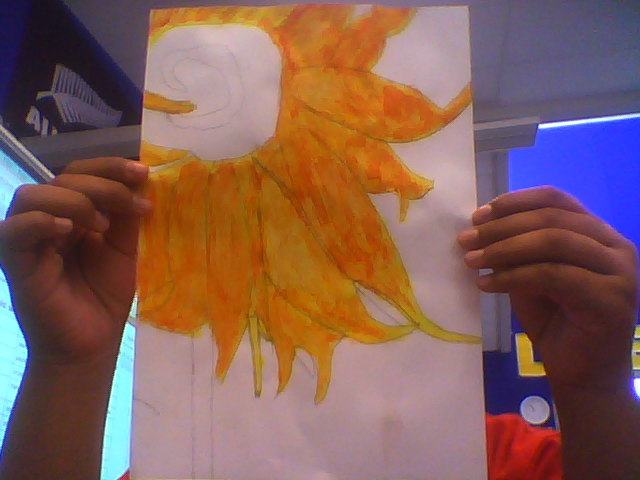 We had to try and sketch a sunflower of his before we would be able to paint it. He used the technique of vertical strokes, so that means that we had to use the same technique as well. I had a little trouble with painting in between the lines. I learnt that Vincent Van Gogh had a sad life and his painting showed some emotions that he felt. After he had died he became famous. Then on Thursday our class went to room 18. We were going to be learning about Pablo Picasso. His style of art was very strange. He would start from one angle of the person then change perspectives. It was extremely creative. My end product looked a little bit like his. I also learnt that during the 20th century his style of art changed as he experimented with different theories, techniques and ideas. That was how he found the creative idea of changing perspectives every time he drew a person from a different angle. The next day we went to room 19. The artist we were observing was Claude Monet. We had to try and use primary, intermediate and secondary colours. We could paint what ever we pleased but with the style of art from Claude Monet. I painted a mountain with a streaming ocean in the back, with a bright sun covered with clouds going from the darkest to the lightest one. Then on Monday we went to room 20. Mrs Squires taught us the style of Daniella Hulme. She loved the style of painting pacific island people. And painting a fruit bowl. 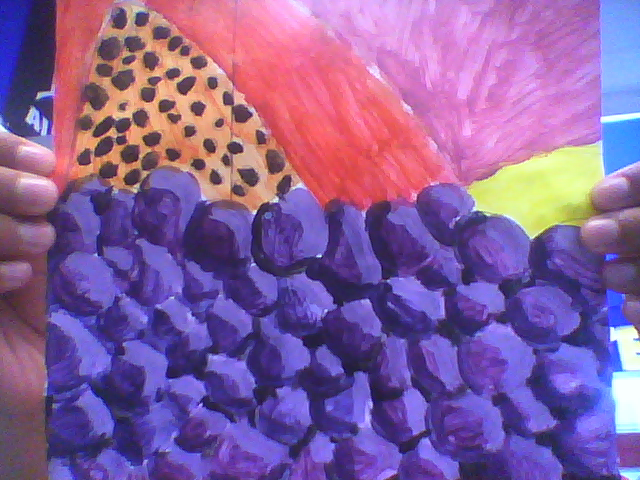 In her class we had to try and mainly paint grapes. It sound so easy but really we had to add detail. We had to shade one side of the grape and make the other side a bit lighter. I learnt that Daniella Hulme paints in oils, with strong, bright colours. Her paintings remind us of Pacific island tapa cloths and carvings. When I had finished my entire artwork I felt pleased with myself. I felt very proud of myself for accomplishing all of my tasks properly. I can’t wait until we have another art immersion week. If we do have another one. Great description about what you are working on in class! I absolutely love that first picture you posted with the fruit pieces. It's fantastic!